When the Chicago Cubs stole the hearts of Belizeans! 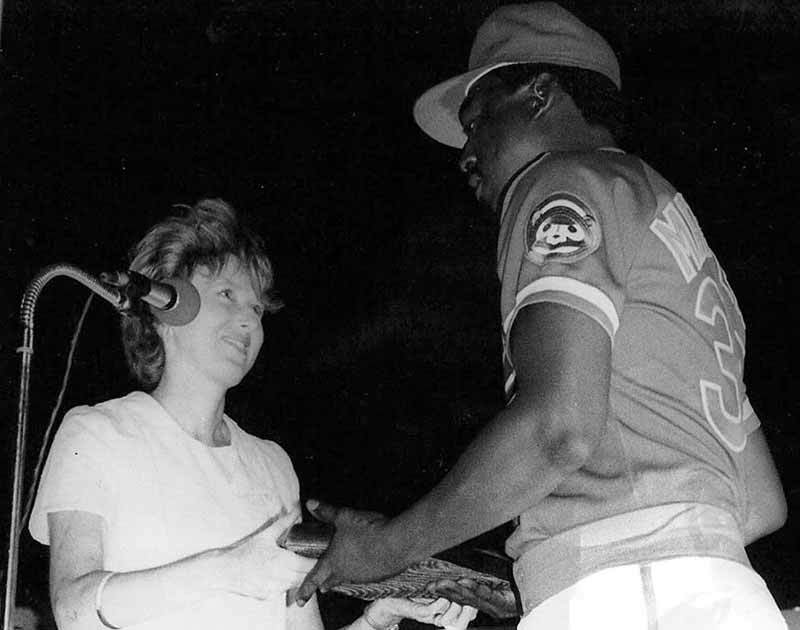 The legendary Gary Matthews receiving a special award from Belize's first lady at that time Ms. Cathy Esquivel in 1985. He was damn late, waited all day for him and he showed up at Yabra Green when majority of his fans had left. When the Chicago Cubs stole the hearts of Belizeans! Belizean children hold Chicago Cubs posters in welcoming their star player, the legendary Gary Matthews in 1985. After 108 years, the Lovable Losers are losers no more. The Cubs. topped the Tribe in 10 to claim their first Fall Classic crown since 1908. Manager Joe Maddon's team halted the longest stretch without a title in baseball, becoming the first club to overcome a 3-1 Series deficit since the 1985 Kansas City Royals. Unfortunately, San Pedro had a power outage in the 8th inning, but celebrated proudly in the blackout! The American baseball team the Chicago Cubs became the country of Belize most favorite team in the 1980's at the arrival of American television into the living rooms of Belizeans for the first time. WGN was one of the only channels we could see. The legendary baseball player Gary Matthews of the Cubs actually visited Belize for the first time in 1985 to soak up all that love that the Belizean people had showed the Cubs during that year's baseball season in the United States. Big yoself up Gary Matthews and the Cubs. 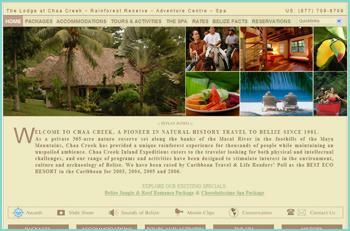 Remember Belize! The Chicago Cubs - if you didn't live in Belize City in the early 1980's - you might not understand the weird connection that city residents feel to those loveable losers. You see, for city residents, when television first came in 1981, one of the only two channels on the air was locked in to Chicago's WGN around the clock - and that channel showed every Cubs game, all 162 of them. Now, this is pre-cable television, pre-internet, pre cell phone, pre colour TV in many cases - I mean, shucks, we only had one radio station!...if you can imagine all that. Less than four years after gaining independence from the United Kingdom, the Central American nation of Belize notched a smaller, yet somehow lasting, triumph in 1985. That winter, the Chicago Cubs sent their star outfielder Gary Matthews, Sr., to visit the country, which is often claimed to be the most Cubs-friendly land outside the Windy City. Matthews's visit was the culmination of a love affair that had begun in 1981, the year when Cubs games began being broadcast in the country. The relationship has continued to this day. Right now many Belizeans at home and inside the United States are cheering on the Cubs, who have returned to the World Series for the first time since 1945 and are attempting to break a championship drought that stretches all the way back to the first Roosevelt administration, 1908. The team finished the 2016 season with the best record in baseball, wracking up 103 wins (and 58 losses), an achievement that put them a whopping 17.5 games ahead of their closest division rival, the St. Louis Cardinals. Melanie Walker, who was born in Belize and lives in the Los Angeles area, is watching the Cubs' championship run with nostalgia. "Of course I'm a Cubs fan," she says. The 42-year-old remembers watching the team play during her childhood. Her husband has been taping the Cubs' playoff games while she works at the Little Belize restaurant in Inglewood, California. He's a Dodgers fan, but she's confident the Cubs are going to win it all this year. Why the Cubs—and why Belize? Like a lot of stories from this part of the world, it began with pirates. In this case, however, the outlaws were local TV impresarios, not swashbuckling Johnny Depp look-alikes. In the early ‘80s, there were no television stations in Belize, the only country in Central America whose official language is English. (Anyone with a set would use it to watch VHS tapes.) In 1981, however, Belize City business couple Arthur and Marie Hoare began transmitting the famous Chicago television channel WGN-TV via satellite, bringing programming to Belize. Channel 9, the Hoares' bootlegged Belize affiliate of WGN, brought Cubs and Bulls games into living rooms and bars throughout the country, sparking an interest in Chicago sports that has continued—with varying levels of enthusiasm—to this day. "As [WGN's] signal was relayed into Belize City by the Hoares, 'world and country' were glued to their television sets to see the mighty Cubs win or lose (mostly lose)," remembered politician Michael Finnegan in a 2013 article in the Belizean paper Amandala. Belize was ripe for adopting a professional baseball team. In the early ‘80s popularity for the sport was picking up in Belize: It had a well-attended travel-baseball league, and game broadcasts from a handful of American cities could be heard on shortwave radios. But "when the Cubs came on, and it was the only station [people] could view, they naturally gravitated to the Cubs," says G. Michael Reid, a veteran Belizean journalist. Other factors helped solidify the connection. There was (and still is) a large community of Belizeans in Chicago. "[They] started going to Cubs games and holding up signs like 'Hello, Belize!'" says Richard Wilk, a professor at Indiana University who was working in Belize at the time of Matthews's visit. "You could go out to the Cubs game and hold up a sign, and your grandma down in Belize would be able to see it." Eventually the Cubs organization—and even Harry Caray himself—began acknowledging its Belizean fanbase. The small country appreciated the recognition, says Wilk. "Belizeans are always getting lumped together with Jamaicans. They hate that." The country's tiny size may have kept American television executives at bay. In a 1989 Washington Post dispatch from Wrigley - South, reporter William Branigin explained that "U.S. broadcasters consider the Belize market so small that trying to stop the operations would not be worth the trouble." The turnout for Matthews—who Belizeans often refer to as just Sarge, his nickname—was enormous. During his parade through Belize City, "I couldn't get close to the road. I couldn't see a thing," says Wilk. Not too shabby for a country whose population was approximately 165,000 people at the time. According to Wilk, more people came out for Matthews than for Princess Margaret, who had visited the year before, and even Queen Elizabeth, who visited in 1986. Matthews brought baseball equipment along with him, which he donated to youth league teams, further enhancing the Cubs' reputation. As the Cubs faded back into mediocrity, however, and additional TV channels sprouted up in Belize offering more than just WGN, many Belizeans moved on. Basketball is probably the biggest sport in Belize right now, says Reid, who admits he's not a Cubs fan. He lived in New York City for some time, and is actually a fan of the Knicks, "which is kinda like basketball's version of the Cubs—they just can't win." Most of the fans watching the Cubs in Belize today are Gen-Xers who grew up watching the team, says Jerry Martinez, a 36-year-old banker from Santa Elena, a city in the western part of the country. If the Cubs can lock up the World Series, Martinez thinks the romance may be rekindled. There are still diehard fans in the country, he says, but "people here usually ride with winners," especially younger Belizeans. However the season turns out, Martinez is determined to make his son a Cubs fan. "I grew up a Cubs fan and will die a Cubs fan," he says. "We're the lovable losers that introduced Belize to baseball." Local cafes and bars are packed, and excited fans talk in the streets about how the Cubs are finally going to the World Series. Cubs fever is everywhere. But this isn’t Wrigleyville; it’s Belize, 2,800 miles away from Clark and Addison. Belize may be home to the biggest base of Cubs fans outside of the Windy City. Why? It all started back when legendary broadcaster Jack Brickhouse was still calling the games. After Belize gained its independence from Britain, a wealthy couple started a TV station, but they forgot to buy some programming to go with it. So instead they found a way to pirate the WGN TV signal from Chicago. “They sort of pirated the signal and broadcast it to homes in Belize,” explains freelance writer Adam Rosen. Rosen uncovered the strange story and says the team has many ties to the country. "when television first came in 1981, one of the only two channels ion the air was locked into Chicago`s WGN around the clock. That channel showed every Cubs game - all 162 of them," recalled a local news anchor. In the winter of 1985, the Cubs sent outfielder Gary Matthews on a goodwill mission to Belize when the Cubs captured the pennant. “99 percent of Belizians are Cubs fans!" said Sylvestre Castellanos, who now lives in Chicago. And that's how the team from the central division, won the hearts of central america. Here is a little history of a different sort, but history nevertheless. Not unless you living under a rock, you don't know that the Cubs have a chance today to break their 108 years drought of not winning a World Series; the Longest in babseball history. The team that holds the second longest drought in history is the same team they are playing tonight, the Cleveland Indians. So it is going to be a batte of epic proportions. The new generation coming up may never know how strong a Cub fan base we had in Belize. Here is an article from the Chicago Tribune which may bring back some old memories for those Diehard Cub Fans. MESA, ARIZ. — There was only friendship to gain, which was the best possible reason for Gary Matthews to make the extra effort. One look at his bubbly countenance told you this trip was an idea well pursued. "I'm glad I went," he said. "Not only that, I'm going back." The Sarge returned to the Cubs' spring training headquarters Sunday with a packet full of pictures and hours' worth of warm memories. The venerable outfielder had taken a couple of days to travel long and far to a strange land --Belize, formerly British Honduras, a country in Central America, population about 150,000. Why the Cubs, with all those season tickets sold, would bother with Belize has much to do with how its inhabitants feel about the Cubs. Seems that WGN's vast super signal is choice TV fare there; when it's time for baseball, everything screeches to an idolatrous halt. At least, until the middle of the seventh inning, anyway. "They tell me when Harry Caray comes on during the stretch, you can hear everybody up and down the street singing from their homes," Matthews related. " 'Aaaah, right. Let me hear yah . . . . Ah, one. Ah, two . . . .' It's unbelievable what great fans they are down there. "I spoke at a huge open field there Friday night. I mean, I looked out and there was nothing but people. Awesome. Cub posters everywhere. They said the biggest gathering in the history of the country was for the Pope's visit, but that I was second. That's not too shabby." Neither was the concept. The government of Belize wanted to celebrate the inception of its Youth Development Program with a special ceremony, and what better way to mark a national holiday than with a true-blue hero? Dallas Green, the Cub general manager, was contacted and, as is his wont, he committed, then saw it through. Ryne Sandberg, Leon Durham and Jody Davis are also beloved in Belize, but Green tapped the Sarge, who was born to be amongst people--whether they're saluting from the left-field bleachers or cheering from a distant hamlet. Chances are Matthews created more goodwill than any politician, ambassador or official hand-shaker ever would have dreamed. "I was apprehensive about going down there only because it came during spring training," Matthews said. "And I thought after all that traveling, I might come back exhausted. Well, look at me. I've got more energy than when I left. It was just a tremendous experience. Helps you put life into perspective. "Belize City is just full of kids, and although the economy is coming back there, it's nothing like the standard of living we have here. Nothing is, and that makes you appreciate what we have in this country. I'm there in a suit, talking to kids running around barefoot. There's probably not much for them to do during the day but watch the Cubs on cable. "When you see the glow in their eyes, it just lifts you right out of your shoes. It's no different than when you tap a kid on the head outside Wrigley Field. Except you know that even the poorest kid outside Wrigley Field has got a better chance at an education than a child in any other part of the world." Matthews, like the sport he plays, does not merely pay lip service to public relations. Baseball is advanced beyond any other game when it comes to working overtime at making fans, then keeping them for life. Even a grizzled executive such as Green didn't think twice when asked a small favor. "You've got to give a little in this business," he said. "If Sarge going there helped one kid feel better, it was worth it. Knowing him, I'd bet he made a lot more than one kid happy." The kid that is Gary Matthews was all over the clubhouse Sunday morning, showing teammates snapshots of his new pals. "Boy, is Harry Caray ever big over there," repeated Matthews. He plans to do a book with Tribune sportswriter Fred Mitchell, and Sarge will leave a chapter for his next journey to Belize, an extended one. "I'd like to meet more people, and also introduce myself to a few fish," Matthews went on. "They say you can catch everything over there. Marlins, everything. One of the greatest fishing areas in the world, they say." But throughout his short stay, Matthews didn't hear of any Little League program in Belize. Soccer is popular, and he saw some basketball courts. However, this country, crazy about the Cubs, had no organized youth baseball program to his knowledge. "Last thing I promised them before I got on the plane was to ship some equipment over," said Matthews. "And after seeing the look in those kids' eyes, if I didn't come through for them, it would tear me up. I don't know if I made them feel good, but I know they made me feel good. "I'm sending over 48 cases of baseballs for starters, and then I'll arrange to have some bats and gloves, too. I'll talk to people I know at sporting goods companies here. And I know my teammates. If I tell them what I want to do, there'll be no problem getting them to chip in. Course, if I start by asking Rick Sutcliffe for a contribution, we might not need money from anybody else." Before the advent of television broadcasting in Belize in the early 80s, locals would tune their radios to frequencies put out by the American Air Forces Radio and Television Service, and followed a number of MLB teams, including the Yankees, Dodgers, Giants, and Cardinals. Radios were Belize’s lifeline to US sports, as TVs were only used to watch VHS tapes. At the time, if someone said you sounded like a “bad Spanish radio station,” it meant you had a habit of inserting yourself into other people’s conversation. All of this changed in 1981 when local businessman Arthur Horace, who got his start building and selling boats, and his wife Marie founded the Baymen Broadcasting company, “bayman” being the name given to early European settlers back when the country still called British Honduras. The company broadcasted on channel 9, yet failed to provide any original content of its own other than local commercials and live parade feeds. Instead, the company decided to ‘pirate’ another channel for its content, which it did by receiving and transmitting TV signals from WGN, a prominent TV station based in Chicago. In ’81, Belizeans now had access to local Chicago news, “The Jeffersons,” and most importantly, all 162 of the Cubs’ regular season games. The Cubs didn’t even have to fight for the title of Belize’s “home” baseball team; Channel 9 was one of only two channels that were on during this time. 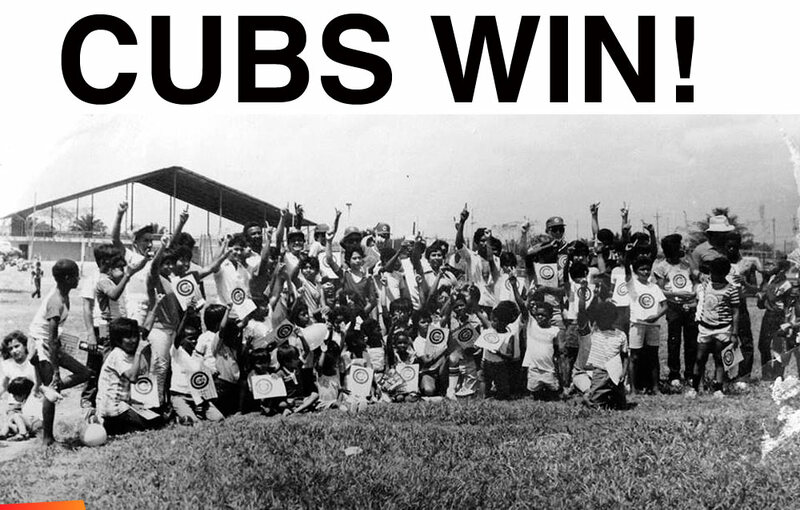 By 1984, Belizeans were enamored with the Cubbies, celebrating when they made the playoffs that season, and subsequently grieving when they couldn’t clinch the World Series. WGN was aware that their channel was being bootlegged, however, did nothing to shut down the channel, as Belize’s market was considered to be so small that it wasn’t worth the trouble to get involved. In 1985, Cubs’ left fielder Gary “Sarge” Matthews was sent to Belize as a diplomat in part of a goodwill trip partaken by the baseball club, despite the organization’s very inadequate knowledge of the Central American country. “I had never heard of that place, what is it called? Belize?” asked Cubs’ manager Jim Frey during an interview in 1983. Frey would go on to explain that when first told about Belize by a fellow colleague, the manager had assumed he was talking about a player, not a country. No matter what however, Belizeans continued to be loyal fans. Belizeans living in Chicago would attend games holding signs that read “Hello, Belize!”, and it was said that you could attend a game at Wrigley, and your grandma in Belize City would be able to see you on her TV. According to a professor studying in Belize at the time, more people had gone out to see Matthews than went out to see the Queen of England during her visit in 1986. Eventually, Belizeans started receiving more and more channels. The Lovable Losers had lost their monopoly on the Belizean people, yet there are still those like my dad who are excited about this year’s postseason. Cubs fans should take comfort in knowing that win or lose, there are others out there, especially in Belize, that will know exactly how you feel.